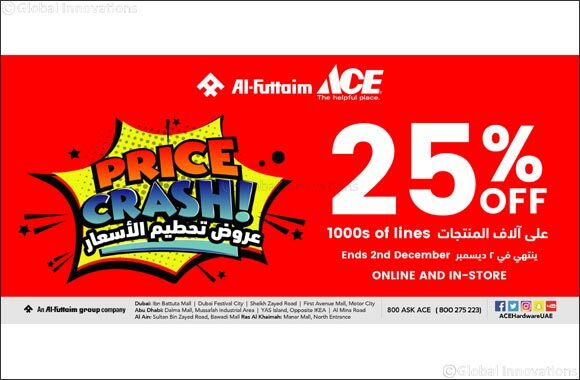 Dubai, November 21, 2018: Al-Futtaim ACE stores in the UAE are gearing up to offer massive deals with up to 75% off on selected items across all categories. The offer is valid on selected items across all categories and customers can take advantage of the exciting deals ahead of the upcoming National Day and festive season. With a wide range of product lines to choose from, and the highest quality promised, this sale marks the best time to shop at Al-Futtaim ACE. The offers are valid on all leading brands including Makita, Black & Decker, Karcher, Homeworks and more. The promotion is valid on a selection of products from Outdoor Lifestyle, Gardening, Home Living, Paint & Décor, DIY, Automotive and Pet care products. Al-Futtaim ACE stores offer a wide selection of Outdoor Lifestyle, Gardening, Home Living, Paint & Décor, DIY, Automotive and Pet care products. With more than 33,000 great products, Al-Futtaim ACE offers world-class brands such as Karcher, Black & Decker, Makita, Clark + Kensington, Weber, Gardena and Leisuregrow. In addition, all stores also have a popular WOW range which has a host of quality products at everyday low prices. Al-Futtaim ACE also offers a wide range of electronic and electrical product in association with Plug-Ins.